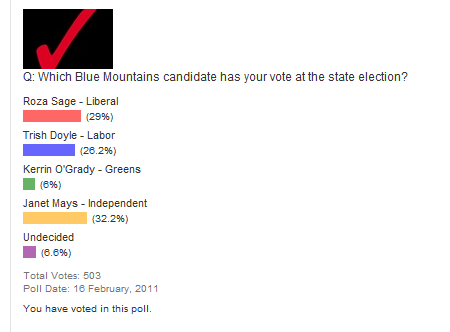 If the results of the BMG poll for the state election are to be believed, it could be a very interesting race indeed. The online poll has had over 500 responses, and places Independent Janet Mays in first place, with 32.2%, leading Libs Rosa Sage on 29% and Labor’s Trish Doyle at 26.2%. If such a result translates to the polling booth, preferences will prove vital to deciding who will represent us in Macquarie Street. The election will be held on 26th March. This entry was posted on Tuesday, March 1st, 2011 at 7:48 am	and is filed under News. You can follow any responses to this entry through the RSS 2.0 feed. You can skip to the end and leave a response. Pinging is currently not allowed.